Go ahead and turn on your printer. Bookmark this page. Log in to Pinterest. I promise- you’ll want to save this recipe. It’s a wintertime keeper! But before we get to the delish details…some blog details. A big SHOUT OUT to Wonderland by Tatu! She included The Usual Bliss on her list of deserving blogs for the Beautiful Blog award. The woman is amazing- a mother of two, with time to craft, cook, and write an entertaining blog. Stop by and take a peek into her wonderland. Thank you for the award! Are you on Pinterest? It was like crack for me while I was planning my wedding, and it’s now my go-to place to search for and save recipes I discover online and want to tackle at some point. I also pin any recipe I make on The Usual Bliss there. Do you have favorite boards I should be exploring? Please share the addiction! The Usual Bliss has a Facebook page! On it, I started a feature called “In the moment BLISS” where I share the things that are bringing me joy right that very minute. It’s nice to feel inspired by the happy things all around me. “Like” me on Facebook and share some of your “in the moment” smiles! I’ve revisited my Life List this week, realizing that while I’ve been great at crossing off some of the items, there are a lot of opportunities there for more accomplishments. I have a few books going at once right now, which will add to my “20 new books” goal. (Got any suggestions for GOOD READS?) I’ve also resumed the Photo-a-Day Challenge for December (link to my photos above). I’m not a fancy photographer- but I do enjoy taking photos of my life, and the prompts make it fun. And last, the countdown to 200 followers is on. According to the number on my home page, I have 191 sweet beings who read what I write. Lucky #200 is not far off! And now, back to the FOOD. 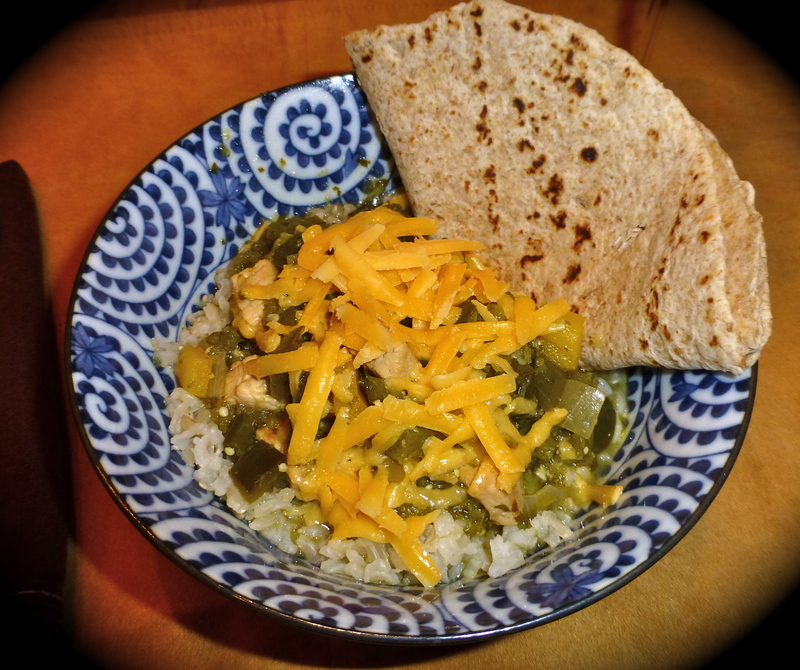 When I first searched for a green chile recipe a few years back, I had a New Mexican green chile in mind. 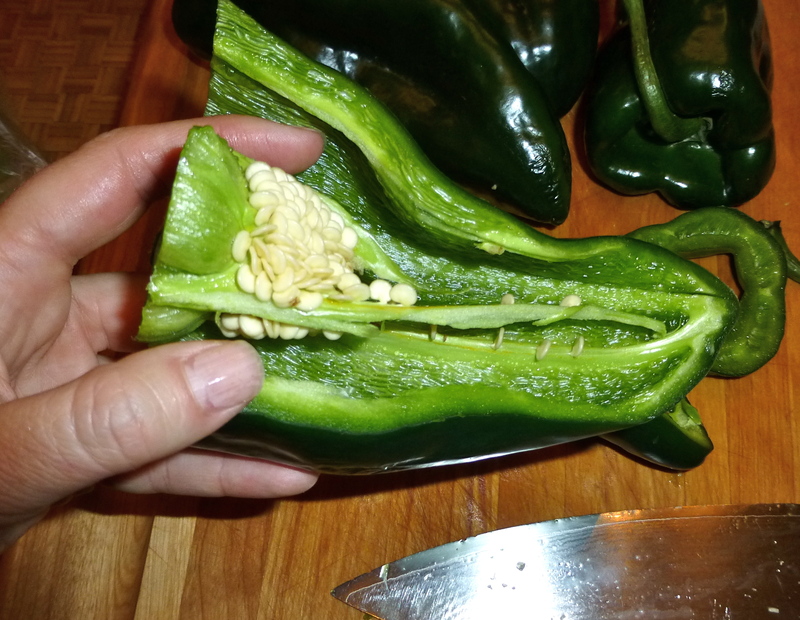 In Durango, green chiles are everywhere. Multiple restaurants have their own version of it, claiming to be the best. When the chiles are in season, grocers will roast them out in front of their stores in a big metal mesh barrel that turns- the aroma is scrumptious. 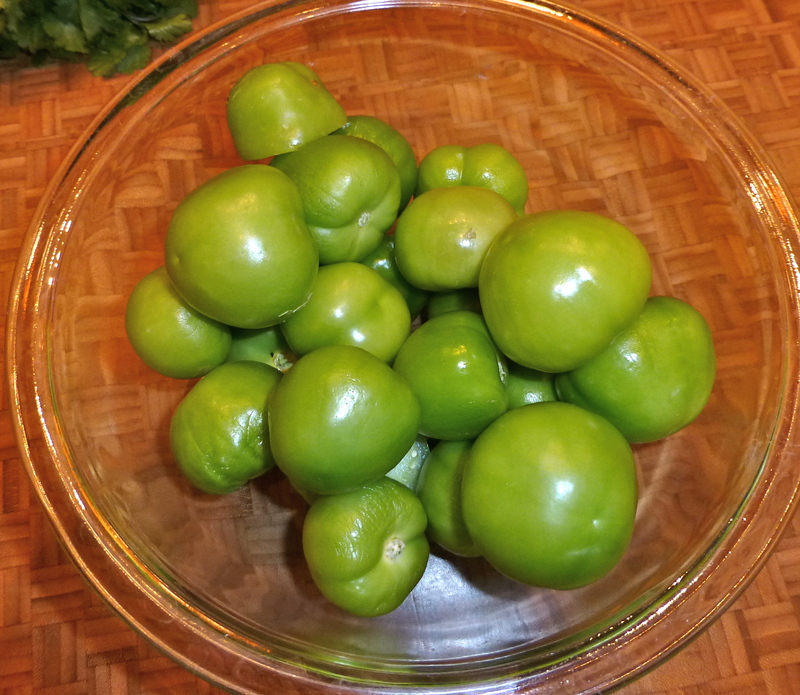 But this recipe uses other green chiles- poblano, tomatillo, jalapeno. I made it once, and now it’s a standing request to always have some in the freezer. The trick to this recipe is to work in stages. There’s more prep involved than my usual recipes, but there’s nothing complicated involved. Do what I did last night- pour a glass of wine and turn on Top Chef while you cook (I was inspired by their knife skills). 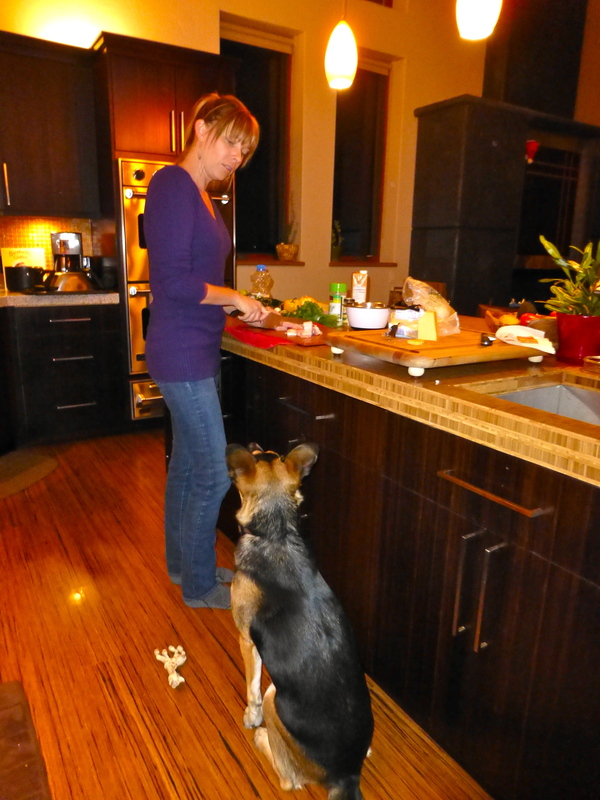 It also helps to have a loyal kitchen assistant. The ingredients are gorgeous- various shades of green, vibrant and fresh. 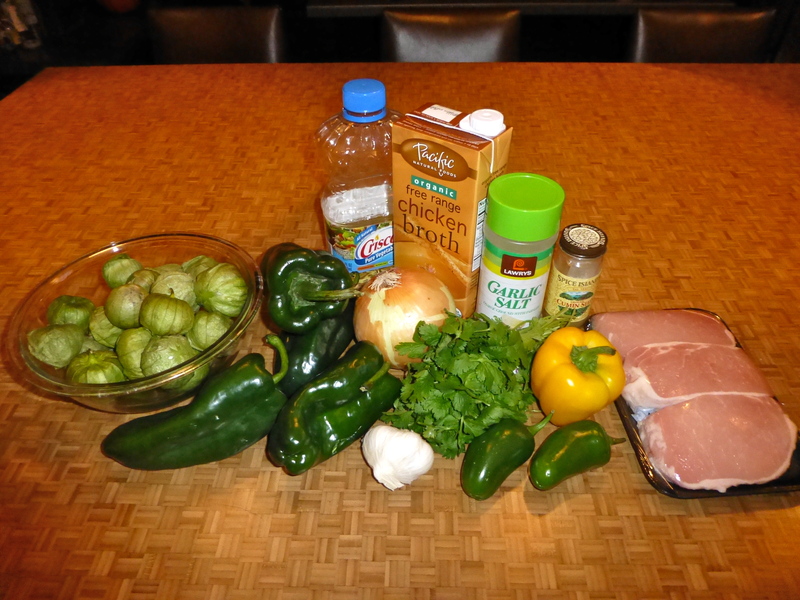 The recipe does call for pork, but I think the chile would be delicious without it, using veggie stock for non-meat-eaters. I need to try a vegetarian version sometime! 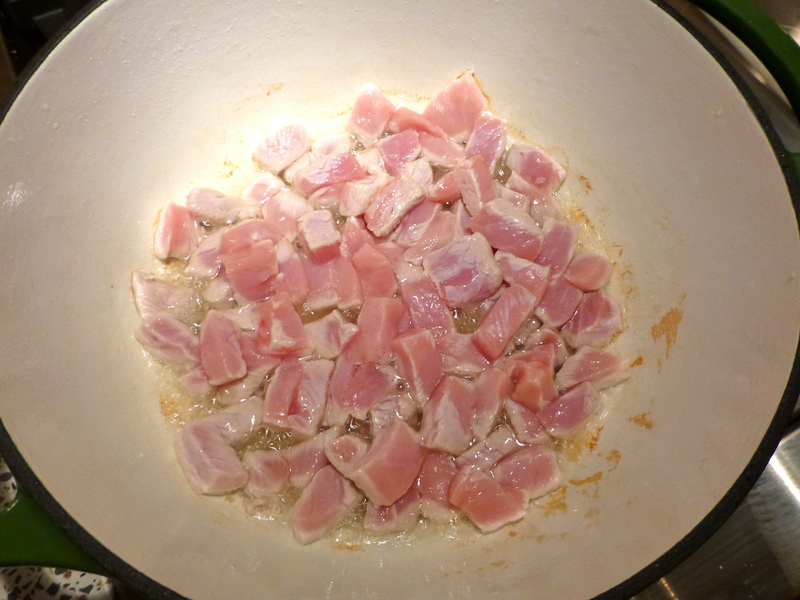 The first part of the process is to cut up the pork into bite-sized pieces and get them going in a pot of oil. 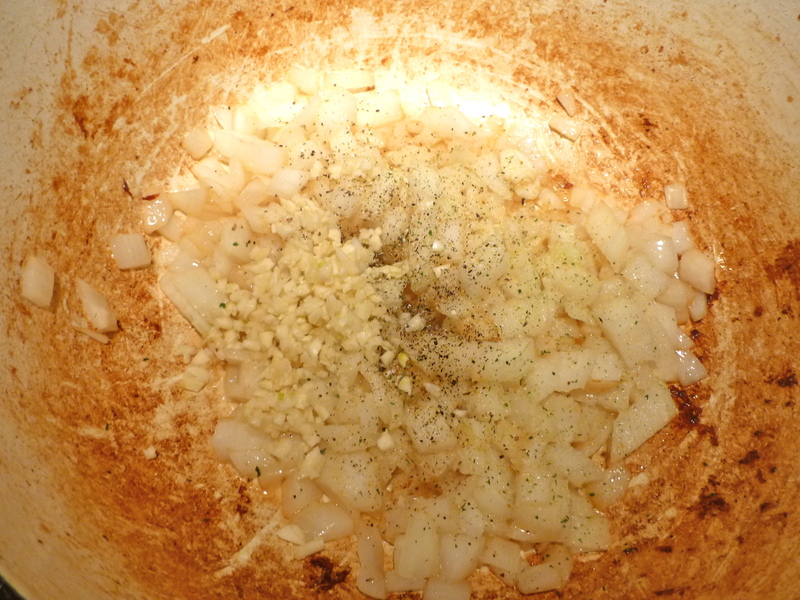 While the pork gets nice and browned, chop up a yellow onion and a few cloves of garlic. This recipe is all about efficiency– taking advantage of pockets of time to prep the next phase. I wish I was this organized in real life. I take the pork out of the pan with a slotted spoon and adjust the amount of drippings in the pot (you don’t want too much). In go the onion and garlic, along with some garlic salt and cracked pepper. 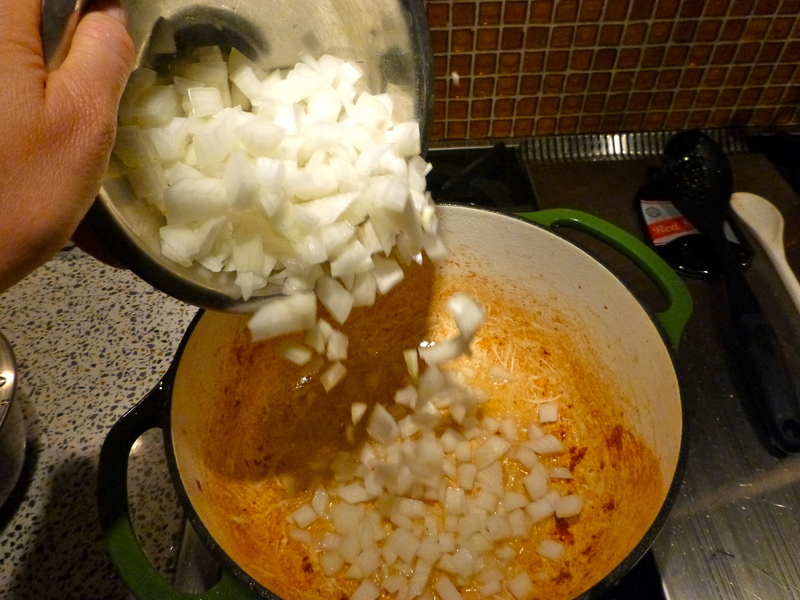 When the onions are translucent, add a big palm full of cumin, the pork, and about 4 cups of chicken stock. Let it do its thing on the stove for a half an hour or so. Warning: the aroma will begin to lure hungry husbands by their noses. 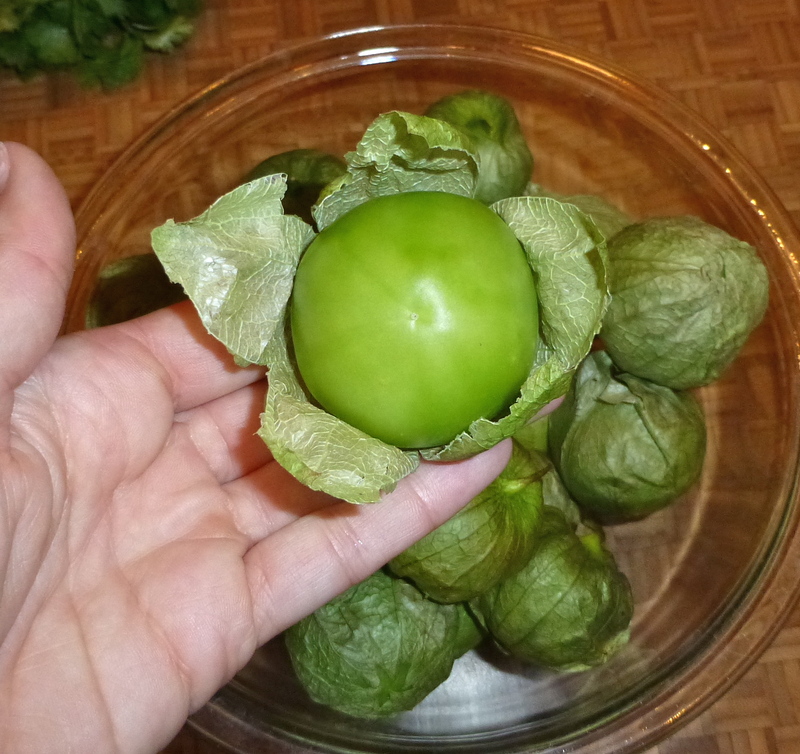 It’s also time to peel the tomatillos. 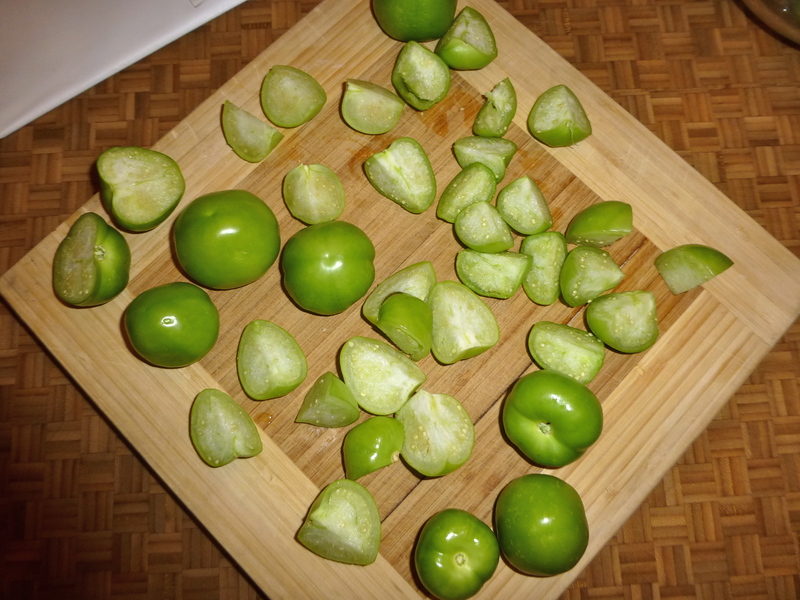 Have you ever cooked with a tomatillo? They come still in their cute little husks. 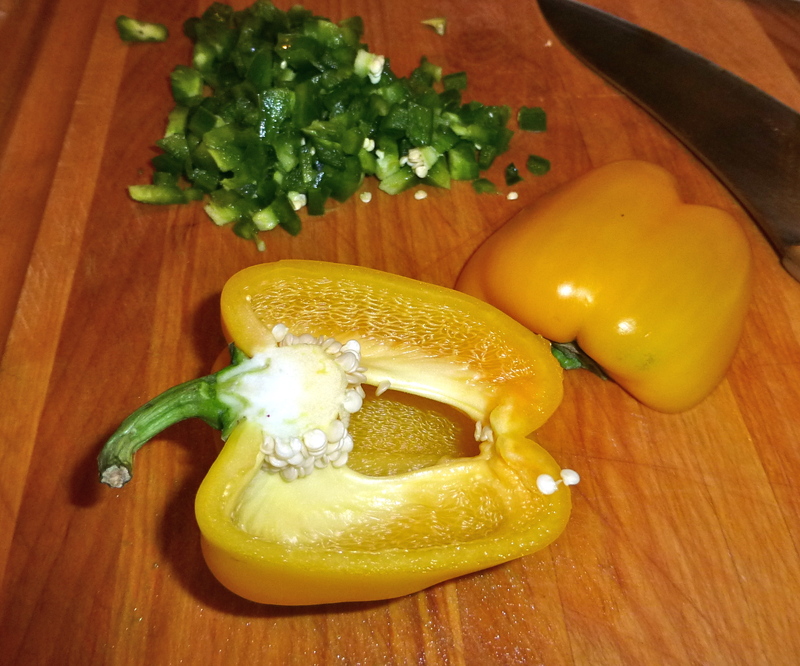 The husks are easy to peel off, revealing a smooth, dense little pepper inside. 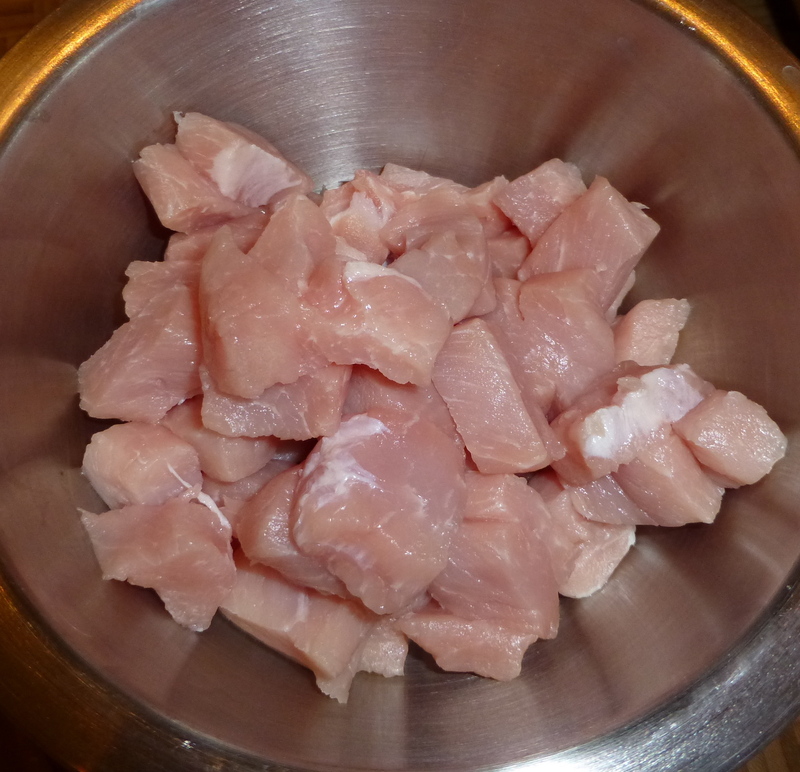 I quarter them to make it easier on my food processor. 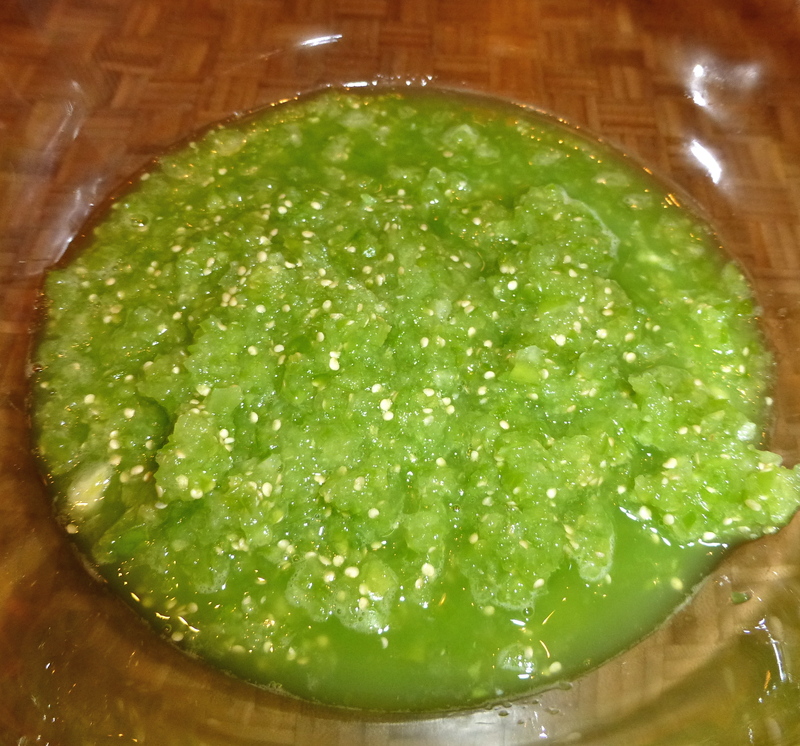 They get blended with a bunch of cilantro and become a bowl full of verdant pulp, kind of like a blended salsa. 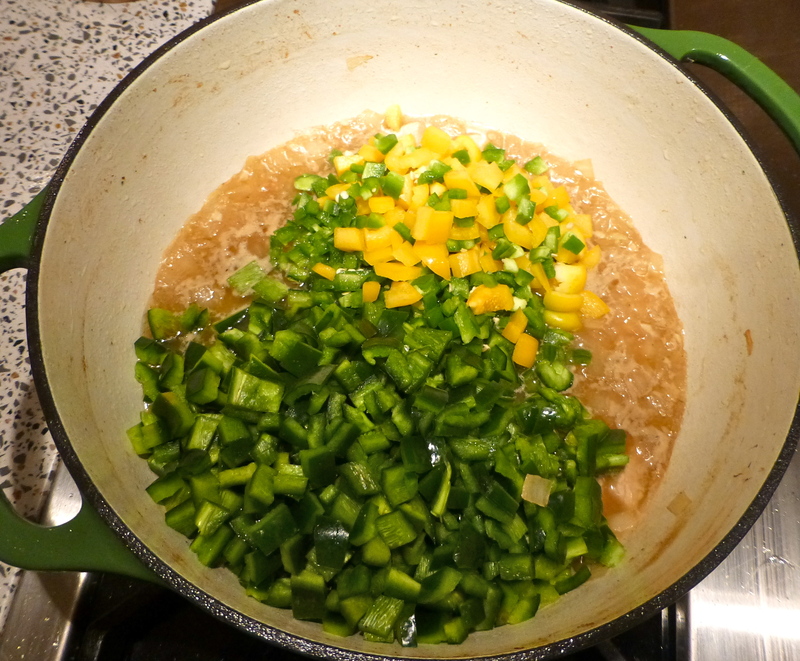 The poblanos, jalapenos, and yellow pepper go right into the pot, and so does the tomatillo/cilantro mixture. 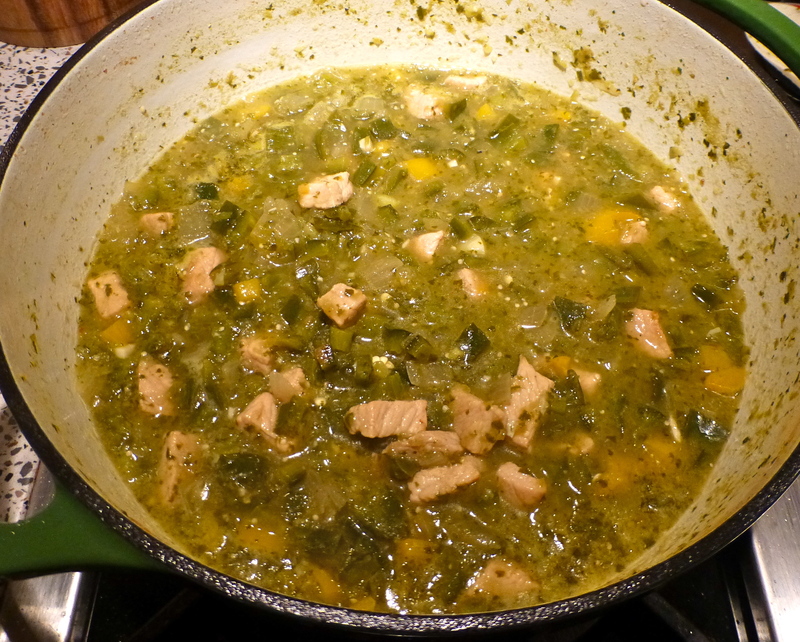 A big stir, and the chile verde is ready to simmer away for an hour or so. 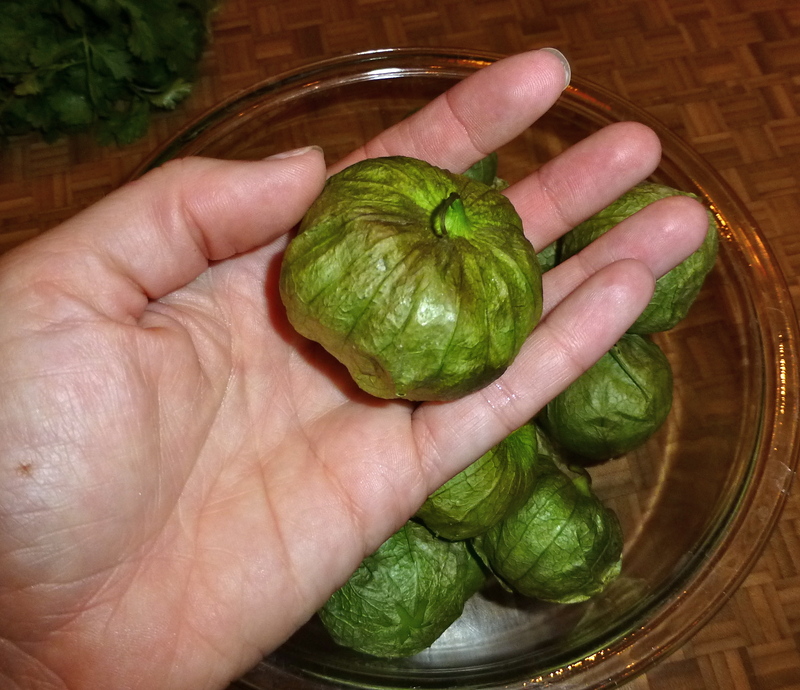 A taste at this phase might reveal a tartness that comes from the tomatillos- it will cook out, eventually, but sometimes I toss in another cube of chicken bullion into the pot. I usually give it a few shakes of Cholula, too. After an hour (or more), adjust your salt and pepper preference. 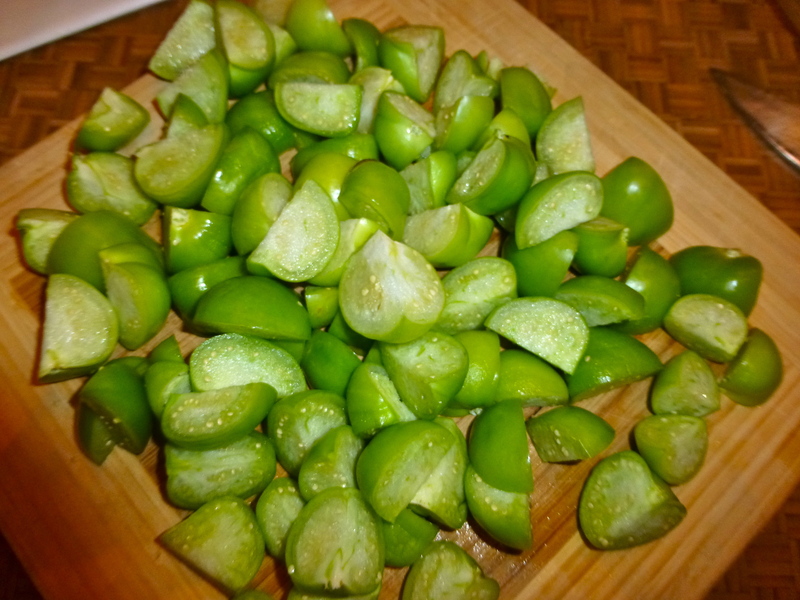 Each batch of this chile verde turns out a tad different, due to the flavor of the peppers or the spiciness of the jalapenos. 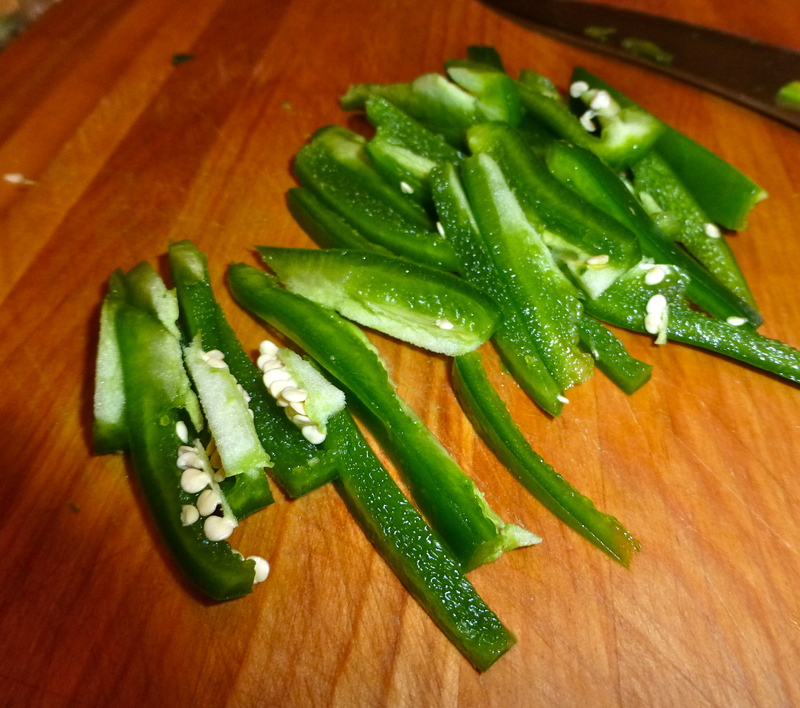 A spicy batch is great with a dollop of sour cream on top. Sometimes we eat it with tortilla chips crunched on top. 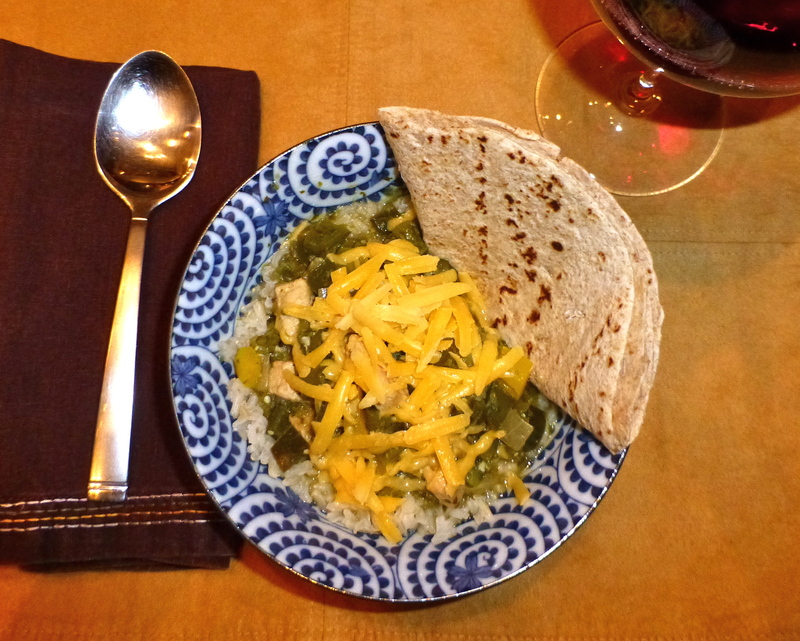 But our favorite way to enjoy this pork chile verde is served over a scoopful of brown rice and topped with shredded cheddar cheese. I like to heat up a tortilla on the side and scoop the CHILE LOVE into it- YUM! 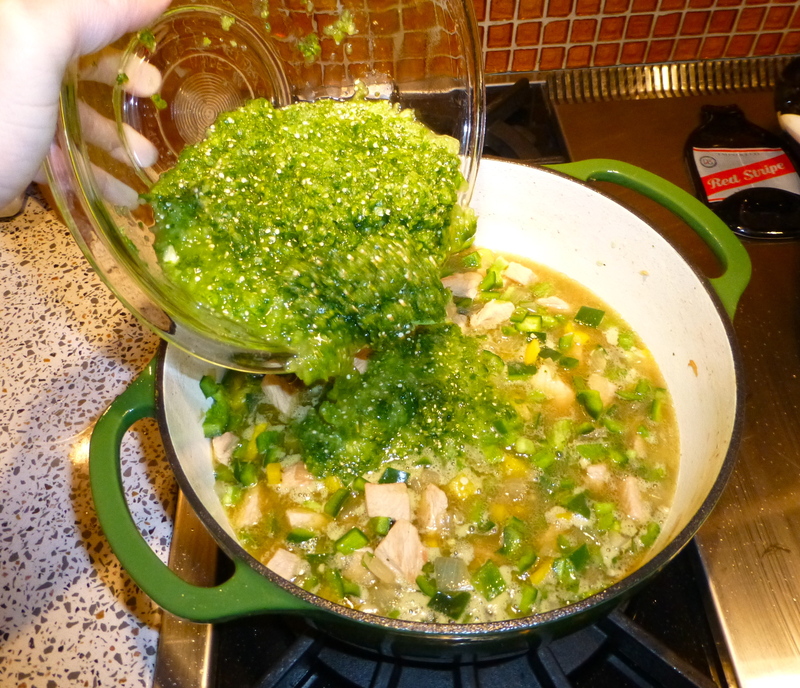 The chile freezes and reheats really well, and like most good soups, tastes better the next day! It’s the perfect meal for a chilly winter night- it will fill you up and keep you warm. And now I have a big batch in the freezer for the season… and a happy hubby. What do you cook that helps stock your freezer for winter? Trim excess fat from the pork and cut into bite-sized pieces (1-2 inch). 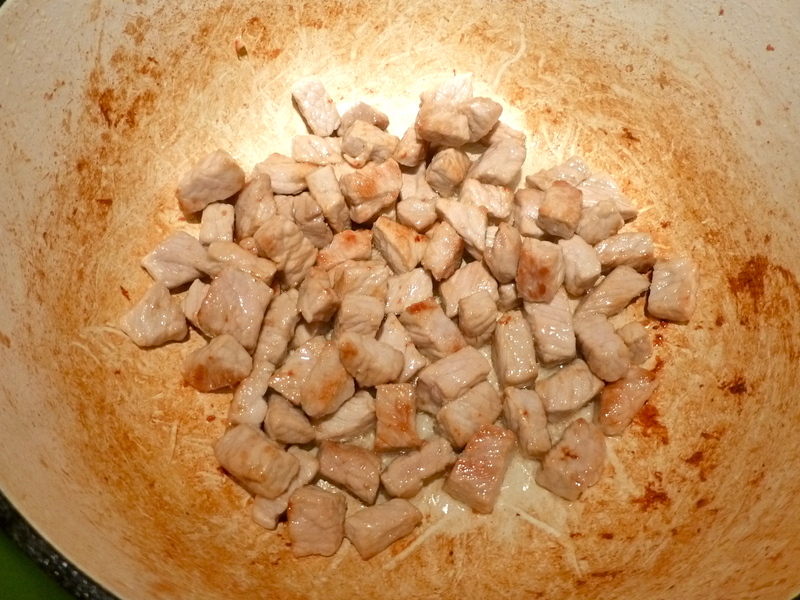 In a large pot, sear the pork on high heat in vegetable oil until golden brown. 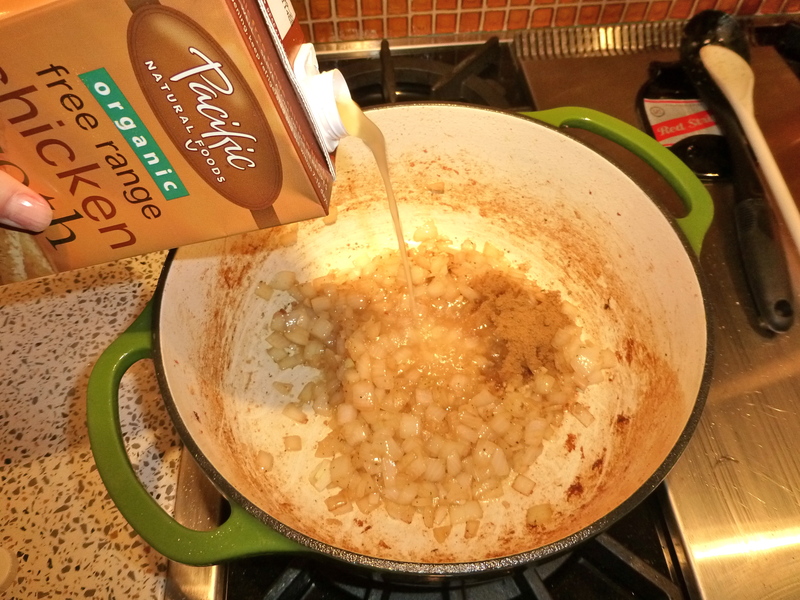 Remove from the pot and pour off all but 2 tablespoons of drippings. 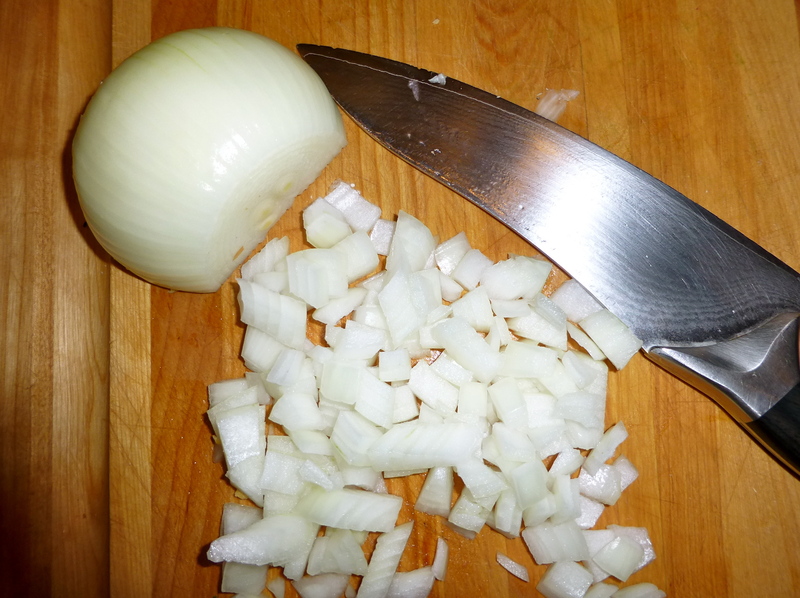 Reduce heat to medium and sauté the onion, garlic, salt and pepper until translucent. 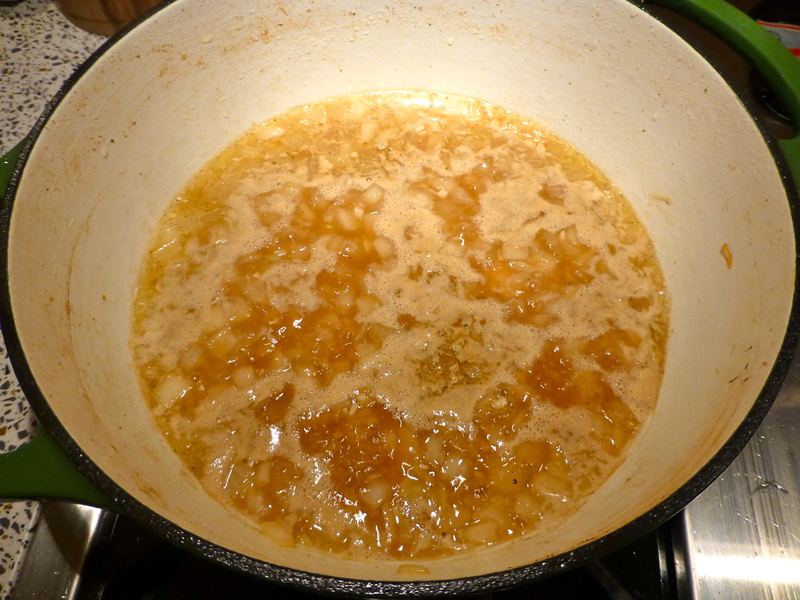 Add cumin, pork, chicken stock. Simmer for 30 minutes. 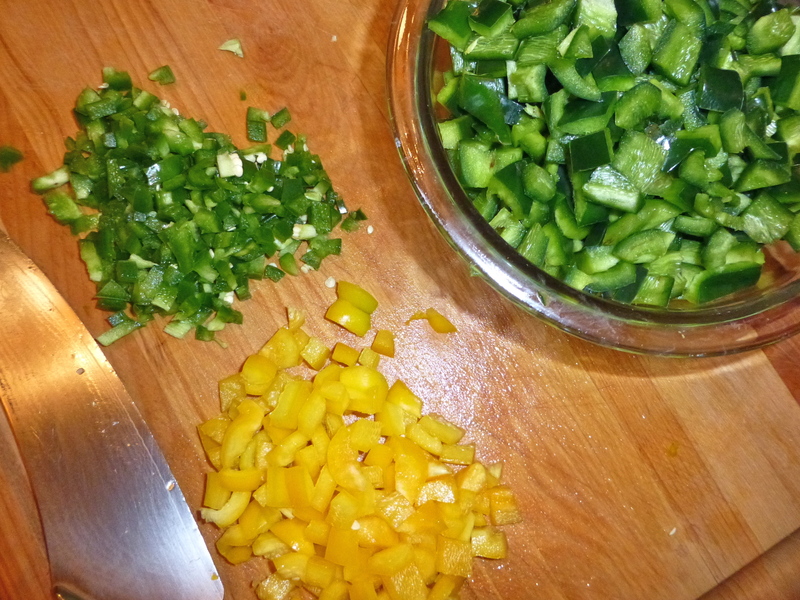 Add poblanos, jalapenos, and bell peppers. 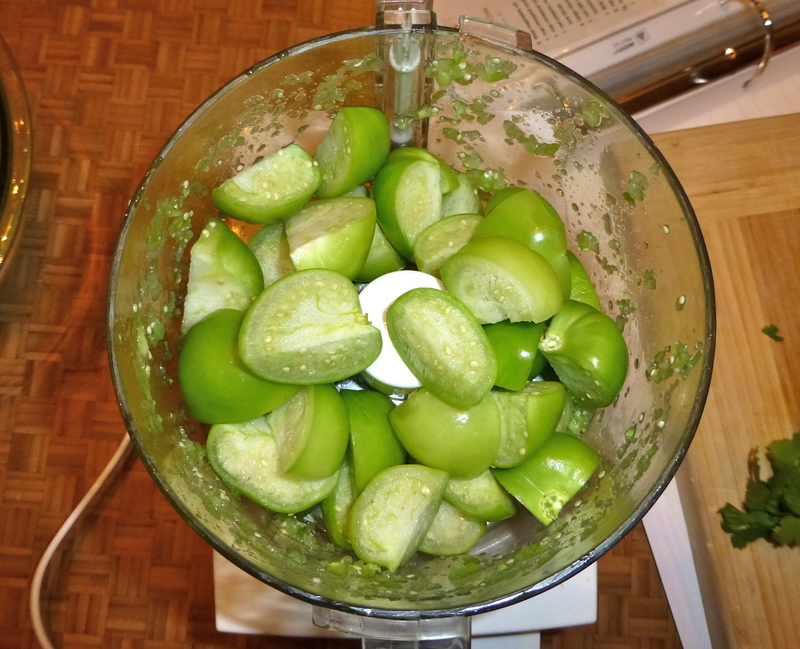 Blend tomatillos and cilantro in a blender or food processor and add them to the pot. Simmer for at least one hour, stirring occasionally. Adjust seasonings. Serve over brown rice, topped with cheddar cheese. Don’t forget the tortilla for scooping. YUM! Next postHoneymoon heaven: Goodbye, my Precious. Haha, no, this one is not a quick recipe, though it’s still easy. It’s one of those recipes I like to make on a stormy weekend afternoon, when I can be in the kitchen for awhile and take my time! this is the kind of recipe I like to eat, not fix! We have three staples that we make a lot of to freeze: garlic soup, tortilla soup and potato soup. Yummy for a quick meal on a cold day! Yum, yum, and yum. What goes in garlic soup besides garlic? Sounds great for days when a sniffly nose starts to threaten! It’s mostly garlic but has potatoes, carrot, celery, onion, spices and veg. stock. I think when I get home I will make another batch and post it to my blog. I can’t call it my own though I got it from a vegan cookbook but the name doesn’t come to me right away. It’s a good one, too. I’ve added you to Pinterest and Facebook! I LOVE all the updates! The more Amber, the better! Yahoo! I found you on Pinterest, too. We can waste massive amounts of time TOGETHER now. A recipe that looks like it’s right up my boyfriend’s alley! Another good one, Amber. I’ve recently discovered Good Reads, and I’m addicted! If you make it, let me know how it turns out for you!